This seems authentic. But on investigation the NSR 0-6-0 was renumbered 2340 by the LMS in 1923, and the LNWR ‘Big Jumbo’, which seems certain to be 867 DISRAELI (the nameplate has eight letters and appears to end in ‘I’, and no other name will fit) was scrapped in August 1915. It seems to be in plain unlined black which would indicate it was repainted after the First World War broke out in September 1914. Something wrong here! My understanding is that the Liverpool-Cromer service only started on 9 July 1923. Perhaps the invisible train is some kind of excursion. Not having seen the original and Judging by the observations that you give, is it possible that there is a confusion over the date. In the old days the number “0” zero was written with a diagonal bar whereas the letter “O” did not. Alternatively the Eight could be a badly written three which would make it 1923. This is certainly Nottingham Midland station because of the roof and valance details, as well as the pointwork between the platforms. The date given as “c 1928” can only be someone’s poor guesswork, or bad writing; I would suggest c 1900. 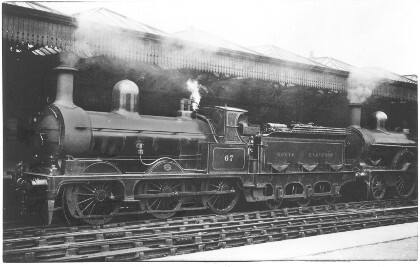 If the LNWR engine is without visible lining, it may be relevant that another of the class was painted all-over black with (dark?) grey lines in May 1898, for ex-Prime Minister W. E. Gladstone’s funeral train. Of course the engine wasn’t ‘Disraeli’ but ‘Gladstone’, but maybe something like this was done for other funeral trains, and it seems unlikely that such an engine would be immediately repainted with full lining. This photo is the subject of a “what,where,when” query (166) on The Stephenson Locomotive Society website. Their conclusion is that it is probably Stockport with the train a Euston to Manchester London Road express around the turn of the century. Yes Tom, I saw the Stephenson Locomotive Society’s ‘conclusion’ that this is Stockport so I sent a correction in November, but it hasn’t appeared on their website yet. Those who claim it as Stockport station cannot have looked at photographs taken there. There are several dozens of these. For well over a century it has been much frequented by camera—wielding enthusiasts, and is now the HQ of the Manchester Locomotive Society. Why anyone would burst into print with guesswork (based on timetables? ), when so many relevant and conclusive photographs are available, is another mystery. But this mystery photograph was definitely taken at Nottingham. This photograph appears in volume 3 of Basil Jeuda’s ‘The North Staffordshire Railway in LMS Days’ credited to T.G.Hepburn. The caption gives the location as Nottingham Midland and the date as 1924. The train is identified as the Yarmouth to Liverpool return working of the ‘Eastern Counties Express’ and the LNWR 2-4-0 as 862 ‘Balmoral’. The photographer T. Gordon Hepburn was living in Nottingham by early 1925, when he joined the Stephenson Locomotive Society. Before then - maybe a few years before - he had lived in Edinburgh, where he was the school friend of an office colleague of mine. They were still in regular contact around 1975, so his age rules out my notion that the date of the photo could be around 1900. Basil Jeuda’s 1924 date and other details look very probable. ‘Balmoral’ wasn’t given an LMS number until 1928, and (according to Baxter’s NSR list, p244) it is “not certain” that No 67 was renumbered in 1923. And as for the plain unlined black on ‘Balmoral’ — it would, after all, be a WW1 job.